Trade wars could hit consumers with higher prices, ASU agribusiness expert says. President Donald Trump has launched a trade war over the last several months involving billions of dollars of goods and affecting the United States’ relationships with several countries, including China, Mexico and Canada, as well as the European Union. In the latest action, Trump announced Aug. 27 a new preliminary trade agreement with Mexico, but not Canada. Troy Schmitz is an associate professor in the Morrison School of Agribusiness in the W. P. Carey School of Business at Arizona State University. Schmitz teaches courses on global food and agribusiness policy, and he said that with so many changes happening so quickly, he is constantly updating his teaching materials to keep up with what is happening in the news. The trade action started in January, when Trump imposed tariffs on solar panels and washing machines from China, and in March added tariffs on steel and aluminum. That led to a round of trade retaliations by China, including tariffs on soybeans and pork, which have already led to a decline in soybean and pork futures — meaning the producers of those commodities will make less money. While the U.S. tariffs have been on goods like cars and steel, the retaliation has been against agricultural products that the other countries import. Schmitz was the organizer of a panel discussion about the economic impact of renegotiating trade agreements for agriculture earlier in August held by the Agricultural and Applied Economics Association in Washington, D.C.
Schmitz answered questions from ASU Now about the trade war and the complicated way it could affect prices and jobs. Question: We’re hearing a lot about tariffs right now. Is this unprecedented? More than 100 years before that we had the Tariff Act of 1828. So it seems that perhaps every 100 years or so we have these tariff wars. What’s different this time is that those were approved by Congress, but President Trump is acting on his own to impose ad hoc tariffs on a grand scale. Q: Why is that authority temporary? A: Congress gives trade promotion authority to the president from time to time, and Trump has it until 2021. Obama was given trade promotion authority in 2015. Q: Why is Trump pushing for a new trade deal with Mexico now? A: With trade promotion authority, Trump can make an agreement and send it to Congress, which has 90 days to either approve it or reject it, without making changes. There is a new president of Mexico coming in on Dec. 1, who would likely scrap an agreement. So they are trying to get a deal to Congress. If you don’t have trade promotion authority, then when you send a trade agreement to Congress, they’ll try to make alterations to it and however many months later you have to go back to the country that you negotiated with. That’s very hard to do. Q: Are trade deals with Mexico and Canada important? A: It’s important for agriculture because Canada and Mexico are our largest trading partners. We export $120 billion in goods to Mexico and $90 billion to Canada every year. Those countries buy more agricultural products than the next 10 countries combined, including China. It’s been estimated that roughly 2 million people have jobs in the U.S. because of NAFTA. Q: What about the aid approved to help the farmers? A: President Trump authorized a $12 billion payment to farmers of the major U.S. export crops hurt by the tariffs. That will cover, by my calculation, approximately four months of tariffs since March. What will he do to help farmers if the tariff retaliation continues? The Farm Bill is being negotiated right now. Under the Farm Bill, if the average price received by producers of many of those export crops, such as soybeans, corn, cotton and wheat, drops below a certain dollar amount per bushel, the U.S. government will give the producers a check at the end of the year to make up much of the difference. If the prices drop low enough due to the tariffs, producers will receive more subsidies from the government than they have in the past several years. Q: Will consumers see the effects of the trade war? A: If it keeps escalating, what you’ll start to see with all the products we import from China and sell at places like Walmart, such as clothing, etc., is that prices will start to go up. At the moment, the agricultural products most affected are soybeans and pork. It takes awhile for changes to hit the supermarket because of production cycles for livestock. As prices move lower, they adjust production. While we’re helping out the steel producers, we’re hurting the ag exporters. The U.S. employs 1.5 million workers in agriculture, and obviously those jobs will be affected if this continues to escalate. An economic analysis done at the beginning of the year found that due to the tariff on cotton, U.S. exports could drop by about 19 percent, and U.S. cotton growers could lose $67 million annually. Over the last decade, 81 percent of total U.S. cotton production has been exported. India, Brazil and Australia are our main competitors. The U.S. could lose out to those three counties, especially Australia, because of the tariffs and because China and Australia signed the China-Australia Free Trade Agreement in 2015 — an agreement that left out the United States. The president’s strategy of creating new one-on-one, or bilateral, agreements is the direction we’re going, but we’re losing out on these multination agreements. Leading media conglomerate Meredith Corporation — owner of brands such as Fortune, Better Homes and Gardens, InStyle, and Travel + Leisure — selects one top tourism undergraduate each year for its Meredith Travel Marketing Scholarship. This year, that student was Arizona State University senior Brady Schmitt. The travel arm of Meredith Corporation invites tourism undergraduate programs around the U.S. to submit up to three of their top students for the Meredith Travel Marketing Scholarship. They look for students who may have extraordinary experiences or unique needs, like being a first-generation college student. ASU began participating in the scholarship program when Professor Christine Vogt, director of the Center for Sustainable Tourism, joined the university in 2015. The school has already established a good track record: Two of the three awardees in the past three years have been from ASU. The first was Virginia Miller, who won in 2016. Miller is now a graduate student in the School of Community Resources and Development. Melissa Luebbe, national travel director for Meredith Corporation and publisher of Midwest Living, a popular travel and lifestyle magazine, saw Schmitt as a stellar tourism student. Rebekka Goodman, lecturer in the School of Community Resources and Development, wrote one of Schmitt’s recommendation letters. “He demonstrates a rare dedication to the principles of sustainable tourism that so many academics hope to instill in their students,” said Goodman, who has had Schmitt in class. Schmitt was also a participant on a spring break study abroad program to Guatemala that Goodman led in March. 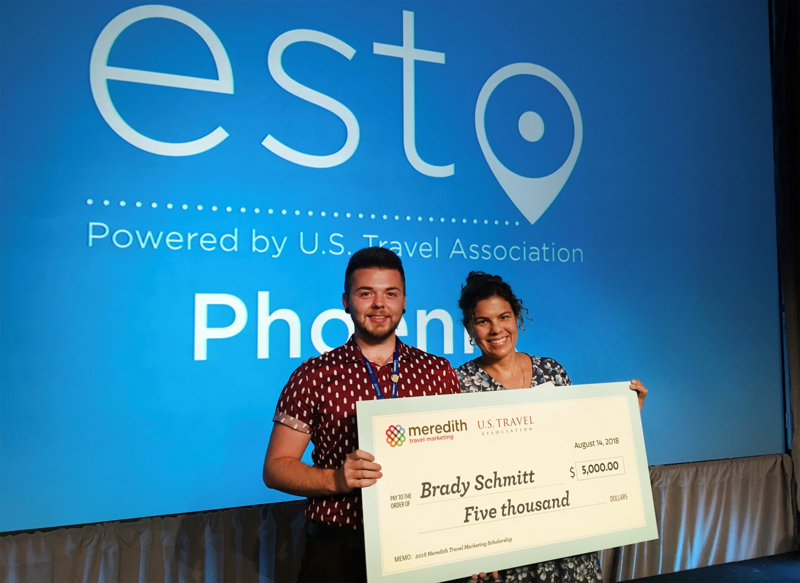 Besides receiving a $5,000 scholarship, Schmitt was invited to attend the 2018 Educational Seminar for Tourism Organizations (ESTO) organized by the U.S. Travel Association, which was held this August in Phoenix. Learning from and networking with over 1,000 industry professionals for five days at the seminar was an invaluable experience that goes far beyond the scholarship prize. Schmitt plans to use his award money to participate in an upcoming Fiji/Australia study abroad program.